This script was created in response to a request by Rebecca Paliwoda over at rpgmakervxace.net forums. 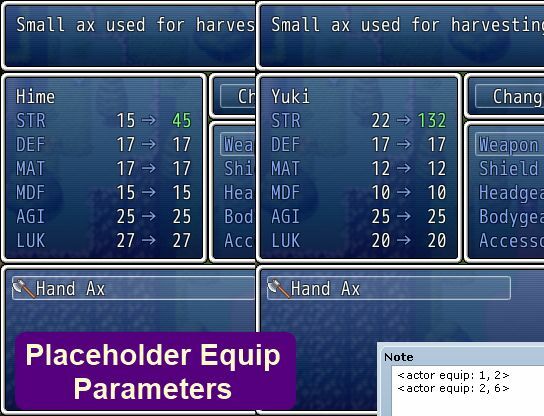 By default, when you put an equip on, the equips parameters are transferred from the equip to the actor. For example, if a long sword provides 20 ATK bonus, then any actors that are holding the sword will receive a 20 ATK bonus. Using this script, you can create a placeholder equip that will pull parameters from other equips depending on which actor uses it. If a long sword provides swordsmen with 20 ATK bonus, but provides mages with 5 ATK bonus, then the appropriate ATK bonus will be applied depending on who is holding it. Where the ACTOR_ID is the ID of the actor that is using the weapon or wearing the armor, and the EQUIP_ID is the ID of the weapon or armor that it should read parameters from. Note that if both actor and class ID’s exist for an equip, then the actor’s ID will be used since it is more specific and therefore has higher precedence.